● Underfloor heating and heated towel rails. ● Oil fired central heating. ● Super fast fibre optic broad band. ● South Facing patio for alfresco dining. ● Morso wood burning stove. Downstairs is open-plan, there is also a cosy living area, both have beautiful sea views. It has been recently renovated to a high standard with oak and slate floors, underfloor heating and a Morso wood burning stove. There is a fully fitted kitchen with dishwasher, microwave, washing machine and separate dryer. Upstairs there are three double bedrooms with king-size Hypnos beds and White Company linen. They all have stunning sea views.Also upstairs the fourth bedroom has two single beds. The master bedroom is ensuite with bath and separate shower. There is a family bathroom with bath and shower. In addition there is a modern downstairs shower room with basin and loo. All the bathrooms have underfloor heating and heated towel rails. Upstairs is carpeted. The house sits on a mini-peninsular which gives it, with its four bay windows, a 200 degree sea view, from the sheltered sandy beach out to the distant horizon and around to the craggy Chynhalls Point. Coverack is a picturesque Cornish fishing village. Nestling around the stone built harbour are a pub and a restaurant both providing excellent food. There is a local village shop which also serves wonderful coffee and freshly baked pastries and a Roskilly's ice cream parlour. Running along the side of the house is a path which leads to the beach. Opposite the house there is a park with swings and a slide for children. Pets, both David and I were bought up with dogs and so know what a big part they are play in family life. Unfortunately not everyone appreciates this and many people have allergies. It is very difficult to remove traces of pets from one stay to the next, therefore we have decided to make a no pets property. My husband and I live in Kent but regularly stay at the property so we maintain it to the high standards we would expect. We love to escape to the hidden away location of the village and immerse ourselves in the uniqueness of the place. We know Coverack well, in fact I have been going there for family holidays all my life and have fond memories of happy summers there. My parents rented this property when I was a child and I took my first steps steadying myself on the granite birdbath in the garden. We bought the house in 2014 and then had it completely renovated. It is centrally located just minutes from the shops and the beach with the route of the South West Coast Path right outside the door. The house is very conveniently located. It is minutes away from the harbour, restaurants and village shop. It also has the added advantage of a dedicated parking area for 2 medium sized cars. There are stunning sea views stretching from the beach round to Chynhalls Point. The house has recently been renovated to a high standard throughout. There are two bathrooms upstairs (one is an ensuite). Downstairs there is shower room/loo.In addition there is an outside hot/cold shower. All bathrooms have underfloor heating. Oil fired central heating providing underfloor heating downstairs and radiators throughout. There is also electric underfloor heating in all bathrooms. All bed linen and household towels are provided. All household towels are provided. Open plan sitting room with flat screen TV and freesat, Italian leather sofas and Morso woodburning stove. There is a separate sitting room area for anyone wanting quiet time away from the TV. There is a large fridge freezer and a separate wine fridge for bottles. A fully fitted kitchen with dishwasher, microwave, fridge freezer, separate glass fronted wine fridge, washing machine and separate tumble dryer. The kitchen also has underfloor heating. Large oak table which comfortably seats eight. We had it custom made with the legs at the four corners so no bashing knees on the table legs or the three people seated at the end all squashed up! South garden with lovely sea views. Amazing week spent with family over Christmas in a well equipped cottage. It is so spacious and beautifully renovated with all the home comforts you could possibly want. The house is just superb and very spacious; it has everything that you need (and more) for a holiday let. The owners have thought of everything and all fittings are of a high spec. The beds are so comfy and the showers very powerful. The outside shower is a great idea. The instructions provided are most helpful and there is so much to see and do in the local area. The views from the house are just amazing and a few mins walk to the harbour, beach, local shop (which is well stocked), excellent restaurant, fab café and also kayak and wet suit rental. You will not be disappointed..........I cannot wait to return! Ideally located, great views, very clean, extremely well equipped, decorated and thought out. We will definitely hire again. Coverack is a beautiful unspoilt spot and this cottage provides the prrfect base for exploring the area. The accommodation is spacious with all the facilities you could need. Views of the sea and coast surround the house which has a lovely modern interior. 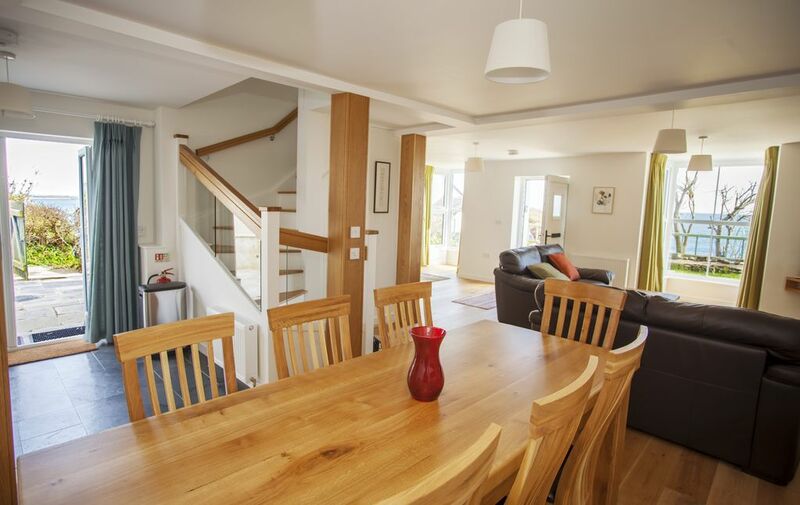 Located central to Coverack village and private off road parking its perfect if you want to stay out of the car as often as possible, walk around the fabulous village and walk to the various coves and beaches along the coast path. We had a fantastic week with the two children and have still got the holiday blues now back in London a week later! We really enjoyed our stay, perfect for a family group and close to the lovely village of Coverack. The house was well equipped and very comfy with stunning sea views from every window! The only two comments I'd like to add are, that as some of our party were coming by rail and plane, it would have been so much easier not to have to bring bulky towels, we would have happily paid extra for towels to be provided in the house. However, I couldn't recommend the house highly enough, we had a marvellous holiday! Thank you! Coverack is a picturesque fishing village in Cornwall. It is on the eastern coast of the Lizard peninsula, about nine miles south of Falmouth. The village retains much of its original charm and atmosphere. There is a large sandy, gently sloping beach, this is rocky in places which makes it ideal for exploring. The beach is great for swimming, windsurfing and fishing. Fishing boats and pleasure craft shelter in Coverack's small harbour - built out of the local green serpentine rock (some of the oldest geological strata known to exist). The Manacles are located just off the Coverack coast. They are a group of dangerous rocks which have contributed to the sinking of many ships and are therefore now a favourite diving destination for divers exploring shipwrecks. Coverack is the ideal holiday location for watersports such as snorkelling, scuba diving, windsurfing and sailing. It is also an excellent place to go hiking. The South West Coast footpath runs through Coverack passing through a wide variety of country and coastal scenery. Rates are subject to change until reservation is confirmed. Please note our changeover day is a Friday.